Turkish-led forces began an assault in Syria’s north-west on Saturday. The row comes just weeks after the two countries’ foreign ministers vowed to improve bilateral ties. The tanks are thought to have been used by Turkey against the Islamic State (IS) group in Syria. However, defence experts have claimed in German media that recent images from Turkey’s “Operation Olive Branch” appear to show them being used against Kurdish groups. Media captionWhy is Turkey attacking Syria? Norbert Röttgen, a member of Chancellor Angela Merkel’s Christian Democratic Union (CDU) party and chairman of the parliamentary foreign affairs committee, said it was “completely obvious” that Germany should not provide the upgrades. He told BBC Radio 4’s World Tonight programme the intervention by Turkish forces was “illegal, contrary to international law and counter-productive with regard to fighting ISIS”. He said Turkey could not claim to be acting in self-defence because “there have not been any attacks on Turkey by Kurdish forces in Syria”. 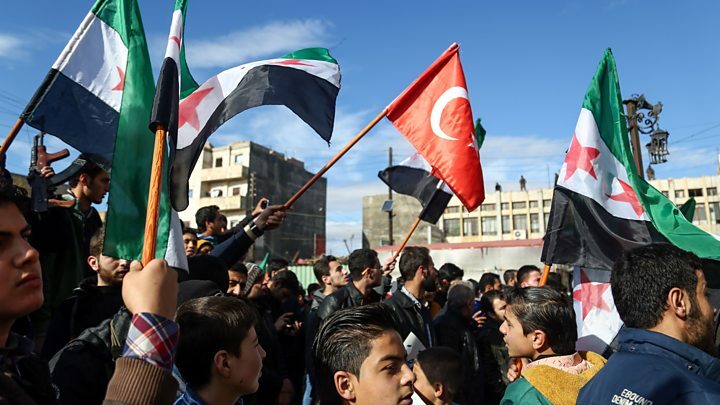 Turkey’s president has vowed to “crush” the People’s Protection Units (YPG) militia, which controls Afrin and more than 400km (250 miles) of Syria’s northern border.